In laser chest hair removal, laser light pulses selectively destroy chest hair follicles by targeting the melanin in them. The pigment in the hair follicle absorbs the pulse, which damages the follicle enough to slow hair regrowth. Our state-of-the-art lasers remove unsightly chest hair safely and effectively, allowing you to customize your treatment plan accordingly. Men’s hair fibers need careful handling because they tend to be tougher and denser. It’s important, then, to choose a hair removal method that can effectively handle the coarse texture without damaging skin. Our laser hair removal systems work on nearly all skin types and tones. Two challenges are red and gray hair; they are difficult to distinguish from surrounding tissue. If the hair you want removed is one of these colors, you can improve results by dyeing it a shade darker before your procedure. Among the safest and most effective lasers available, the Cynosure and Diode systems work magic on all skin types and tones. 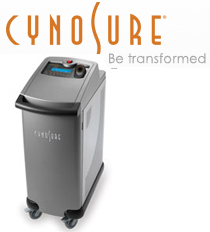 What’s more, the Cynosure system features a unique Cryocooler that keeps you cool and comfortable during your entire session. Our Nd:YAG laser works best if you have darker skin and hair. It has a longer wavelength and is highly sensitive to all skin colors and pigments. This means it can more precisely penetrate hair follicles with no effect on surrounding tissue. You should know that with darker skin comes a higher risk of complications, such as hypopigmentation, keloid scarring, and folliculitis. A laser chest hair removal session can last anywhere from a few minutes to several hours, depending on the size of the area treated. Before your session, you’ll be given protective eye gear and, if you want it, a topical anesthetic. Once your session begins, you’ll feel a stinging sensation. You’ll know then that the laser is active. You may feel a prickling and burning sensation. But don’t worry; it isn’t bad at all. After your laser hair removal session, you may see some swelling and redness. These are temporary and likely won’t keep you from resuming your normal activities. However, you must avoid direct sun exposure. And you should also wear high-SPF sunblock for several weeks afterwards. Rare complications include blisters, swelling, redness, and scarring. Even rarer complications are permanent scarring and changes in skin color. 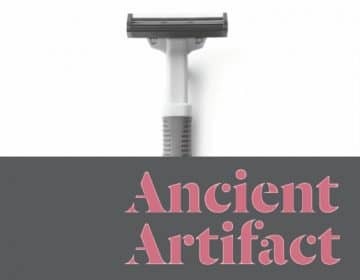 Safer and more permanent than waxing, plucking, shaving, electrolysis, and other methods, laser chest hair removal is so effective that most clients see hair gone forever after some three to five sessions. You’ll need multiple sessions to obtain maximum results, because only chest hair in the active (anagen) stage of growth can be successfully treated. Simply put, laser chest hair removal gets results. Your go-to source for laser chest hair removal is LaserAway. Our techniques are innovative. Our technology is cutting-edge. Our staff is experienced and certified in laser and other dermatological procedures. And we work to make your visit comfortable, enjoyable, and satisfying. 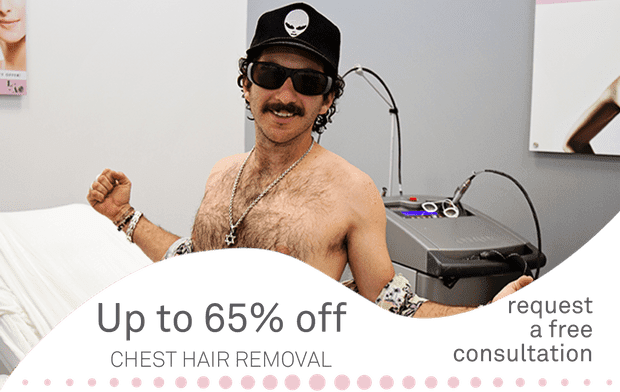 Want to learn more about laser chest hair removal? Then schedule a free, no-obligation consultation today by emailing us LaserAway.com or calling us at (888) 261-8393.